Premise: this post is not about web analytics. Still I've decided to include it here as this is the place where I am present online. At the end of the day I am a blogger too. And like all bloggers, sooner or later we have to get knowledgeable of diffferent blogging platforms, choose the most suitable for our own objectives, and focus on writing about the things we like. Hope you find it useful! Less than two months ago I decided to move all my blog posts from Tumblr to Blogger. Why? There were actually things I really enjoyed about being part of the Tumblr community. But I had clearly more reasons (I am not going in details here) to make a move and get into a simple and popular platform as Blogger. Here below I am reporting tha main steps I took (sussessfully, thanks god) to move my blog posts from Tumblr to Blogger. I will try to do it in a very quick and simple way, as I hope your migration will be. For each step I provide the link of the tool/tutorial you can refer to for more info. Ok, let's start. Good luck. The first step is to export all your Tumblr posts into an HTML file, so that you can later import it into other blogging platforms. I didn't find any tool inside Tumblr offering this service, but fortunately there are a couple of tools available on the internet, doing the right job for you. I suggest the "Tumblr2Wordpress tool": once in the page, select HTML as Exported Content Format, and export for "Self-Hosted Wordpress Installation". Once you performed Step 1, you need now to convert the HTML into a XML file in order to be imported into Blogger platform. Again, I guess there would be various tools available on the web; I personally used the "Wordpress2Blogger Application", uploaded my HTML file and got back an XML file. Very easy. For steps 1 and 2 a great explanation is provided also by JumboDumboThoughts. 3. Log into Blogger and create a new user, if you don't have one yet. Create your new blog. From your Blogger dashboard, click on Settings--> Other --> Import Blog and upload the XML file that you have hopefully saved somewhere in your local machine. I recommend keeping a backup copy of both your HTML and XML files in your local machine or better on the web. You might need it in the future. In my case, all posts were imported fine except for some videos for which I had to review links and titles (some tumblr post types did not have titles). My recommendation is to manually check each post for errors/wrong format you might have incurred during your migration process. Unfortunately, I have not been able to export Tumblr comments, which were managed through Disqus. At this point hopefully all your posts have been correctly imported into Blogger, and are ready to be published. Almost ready, actually. It's at this point that you might want to review your blog design, template and look of your posts. If you have a custom domain and want to use it for your new blog on blogger, you can. Blogger offers two publishing options for your blog: hosting on Blogspot (example.blogspot.com) and hosting on your own custom domain (www.example.com or for me www.analyticsforfun.com). I believe this is an important aspect to keep in mind, when migrating your content from one platform to another one. Google don't like duplicated content and actually penalize it. To avoid your blog being penalized (I mean penalize your ranking on search engine results), I think a savvy solution is to use 301 redirects on your old blog platform: these redirects send visitors and search engines crawlers to your new domain and make it very clear which URL should be indexed. Another option to manage the duplicated content issue, could be also hiding your old Tumblr blog from search engine. I am not sure if this is a valid solution, but it is certainly faster. From your Tumblr dashboard, go to Settings--> click on your blog avatar--> scroll down to Directory and make sure the option "Allow search engines to index your blog" is not active. Whichever option you decide to take, you should be able to keep your old Tumblr blog and do not need to delete it. Of course, from now on, your new blog will be Blogger. Once you have double checked this and decide to go live with all your posts on Blogger, simply click "Publish" on the Posts menu. The posts will be published with the original date (dates of posts are imported too within the XML file). In simple words, a Sitemap is a list of the pages on your website, like a table of contents showing the structure of your blog. Creating and submitting a Sitemap helps make sure that search engines (Google, Bing, etc.) crawl and index your blog/website properly. Done. The sitemap has been submitted, and unless you received some errors, your blog will be ready to be crawled and indexed by Google. Remember, this Sitemap submission was valid for Google. If you want to submit it to other search engines, you should do it through their appropriate tools. 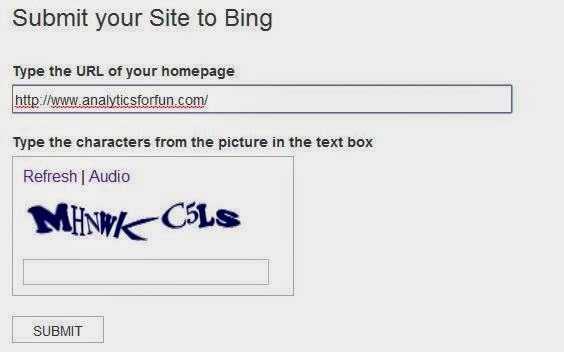 For example, for Bing you will submit it to Bing Webmaster tools. 1) Create a Google Analytics account, if you don´t have one yet. 2) Create a new property for your blog: you will get a traking code. To install it in Blogger, you actually don´t need the entire java script code, but just the Web Property ID (the UA code). 3) From your Blogger dashboard, go to Settings-->Other--> Google Analytics and enter there your Web Property ID. Once completed the above steps, you should see data in your Analytics account within 24 hours. ***Bonus: Check out this post to learn how to get the most from Google Analytics for your blog. The process for moving from Tumblr to Google is quite simple and won't take you long if you folow the 10 steps I suggest above. The aim o this post was to centralize and summarize all the info I researched on the web, when I moved my own blog. And combine it with some important SEO tips in order to make your content easily optimized for search engines. Hopefully these guide will save you time and please share your feedback if you think the migration process can be improved further. I am impressed by the quality of information on this website.Thanks for sharing this post. Glad you shared this post. It is best to participate in a contest for probably the greatest blogs on the web. I'll recommend this web site!